Here's my postcard for The Craft Barn Quotes and Lyrics Challenge where the words are Marriage and/or Age. Well I've been searching for quotes and lyrics but nothing inspired me till I found these lyrics on marriage from 'Love on a Farmboy's Wages' by XTC (early 1980s). I'm not sure I've quite captured the scene but it's supposed to be an idyllic country setting with a colourful sunrise and a cornfield - done with Distress Inks. I've stamped and embossed Tim Holtz's Sunrays using Sunflower Brilliance and lots of vegetation from Chocolate Baroque and Crafty Individuals stamped with Thyme and Pearlescent Ivy Brilliance. If I have time, I may have another go at this to see if I can improve the perspectives. Meantime, I'm off to see what everyone else has created. Thanks for looking and for your comments - they are very much appreciated!! Well done for finding these lyrics, I never found any as good. Your country scene goes great too. I could just picture a young couple riding off into the sunrise to get married....I think you did a beautiful job! Beautiful page, love the sun. 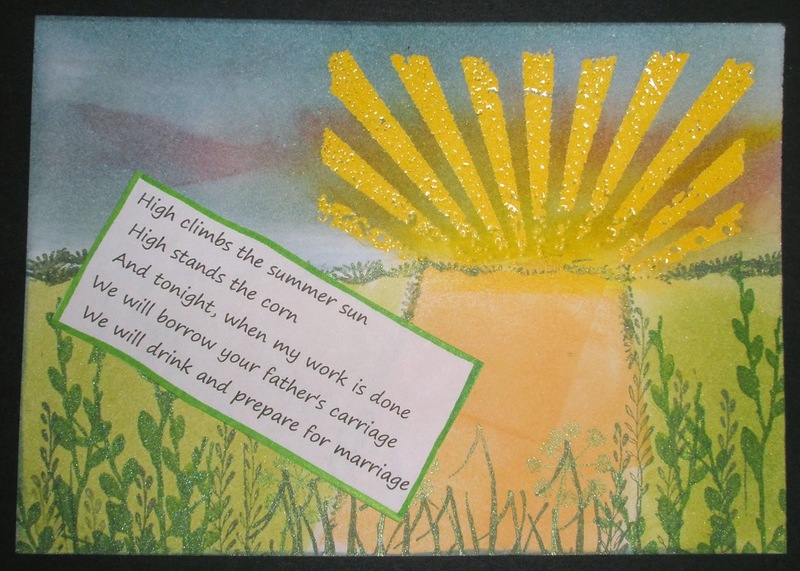 Your postcard speaks of love and marriage, as well as the field in the sun. What more could you ask for? I love it, and feel the perspective is great. After all, we are always our own worst critics (grin). Love that sunburst - great idea! Love the scene created and the fabulous lyrics. I feel the warmth.....love the verse. I love your sunrays and it's a great lyric. It's a lovely country scene! Great work Elaine. I think your scene captures the lyrics very well and it just gives me a feel good feeling. Lovely lyrics too.